Flock of Tea Cosy ships to North America (Canada and the USA), Europe, Australia and New Zealand. All shipping is done by Canada Post via one of their service options which is estimated to take 4 to 12 days and insured through InsurePost. This service combination provides insurance but does not provide a tracking number, unless within Canada or unless it is a bundled order. Bundled orders – depending on its destination, if you order more than one tea cosy they will be sent via a Canada Post service which provides a tracking number. The cosies are shipped flat in a padded envelope with unpacking and spot-cleaning instructions enclosed. Any duty, taxes or brokerage fees are the buyer’s responsibility. Please note that Flock of Tea Cosy is unfamiliar with what these charges might be to your country. To-date I am aware of only two packages held at a border for VAT charges. Because the shipping is done via the public mail system, this insured service requires patience for the recovery of any lost or damaged goods. Canada Post generally requires 45 calendar days to have elapsed from date of mailing before, along with InsurePost, it will open a file to begin the claim. Flock of Tea Cosy is unable to provide refunds until the insurance claim with InsurePost has been confirmed. The good news is – to-date this mail service has only failed once. There have been a few delays, but all the other cozies arrived safely. 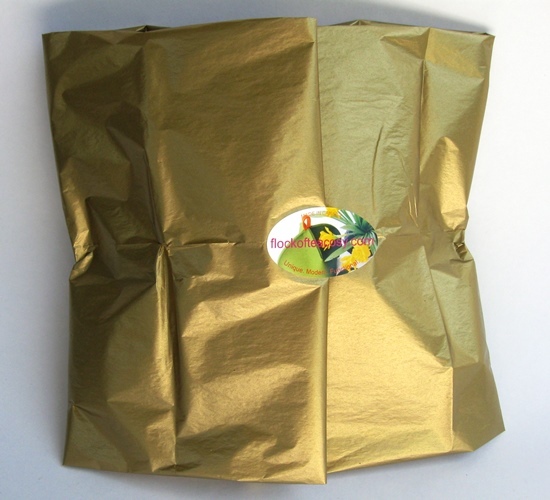 If you receive the package in damaged condition, before opening please take photos of all sides of the package, and, once opened, the cosy itself. FoTC will assist in procurring the insurance coverage. Some patience will be required as Canada Post and InsurePost require a certain amount of time to process claims. Thanks for your understanding of these policies — FoTC is a one-person, artisanal studio and not a giant, multi-national. Put a note in the “Order Notes” field and your personal message can be included.